A porch and stairway is usually the first thing visitors see upon coming to your home. Therefore, this area should be aesthetically beautiful, warm, inviting, as well as safe to enter. In damaged or older concrete entryways, it's especially important to fix sunken concrete and large cracks that heels of shoes get caught in. 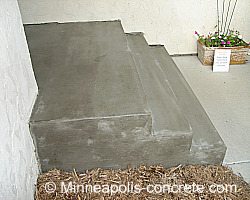 If the concrete moves when stepped on, a tear-out is definitely the best prescription. 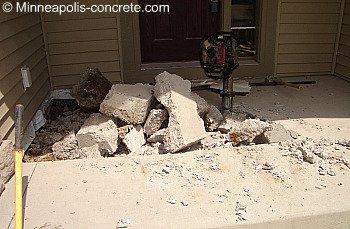 Non-structurally sound concrete must be torn-out and re-poured. In some cases, the builder or prior contractor was negligent in following codes and procedures to make concrete structurally sound. In the below before and after pictures, this concrete porch sunk because the contractor didn't dig out dirt at the foundation location so the porch could be poured on the solid foundation. In these cases, tear-out is a necessity. This is a great option if your concrete is structurally sound and has only hairline cracks. The stain will update your look and the cracks will be less noticeable. 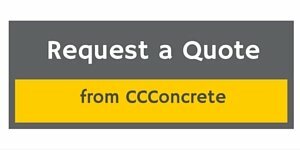 To find out more about staining, click stained concrete. A resurfacing compound may be placed over the top of existing concrete to hide cracks and make it look like new. 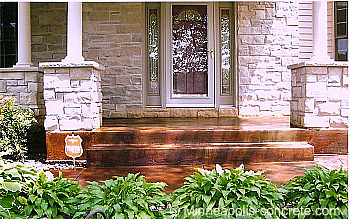 An integral color may be mixed in the resurfacing compound to have a colored porch, or wait until the compound is dry, and stain the porch. Click to find out more about the process of concrete resurfacing. 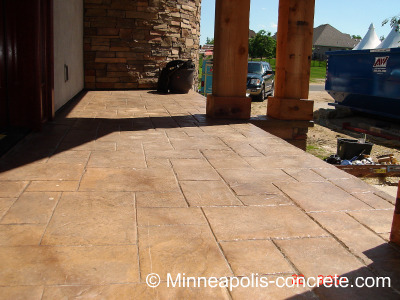 An overlay is a layer of new concrete poured over existing concrete to make a new surface. 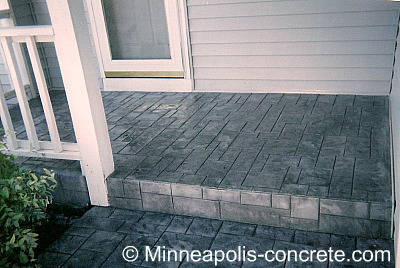 This is the way to achieve a stamped and colored porch without the expense of tearing out the existing, structurally sound concrete. If your concrete has a lot of cracks though, there is no guarantee that the cracks won't show through the overlay. 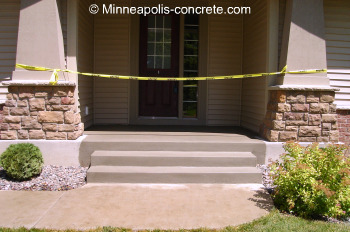 If you would like a bid on a new stoop or porch repair project and you live in the Minneapolis and surrounding suburbs area, request a quote.